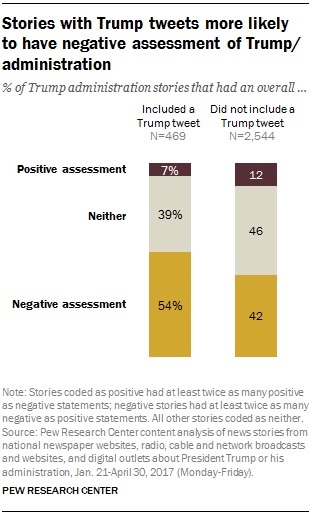 News stories mentioning Trump’s tweets “were more likely to have a negative assessment of the administration’s words and actions"
If you read a news story that mentioned a tweet by President Donald Trump during his first 100 days in office, odds are that the story was not favorable to Trump. 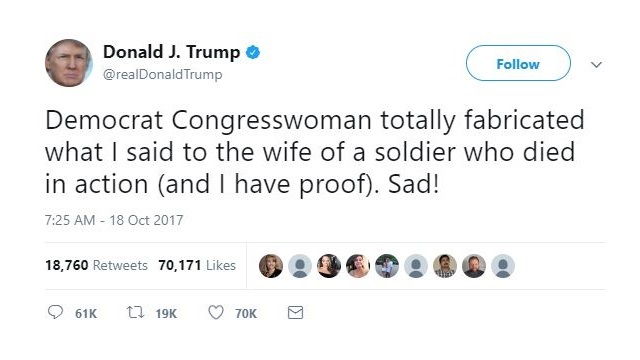 Pew Research Center released its analysis of more than 3,000 news stories during the administration’s early days, saying that across the 24 outlets it studied, 16 percent of news stories about Trump or his administration mentioned a @RealDonaldTrump tweet. 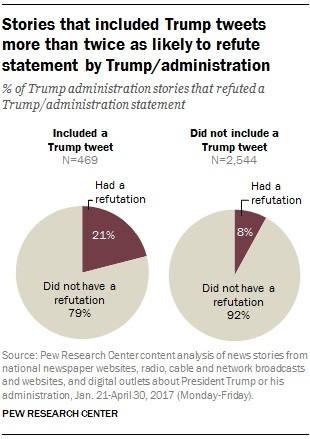 Pew added that roughly one out of every 10 stories included direct refutations of statements by Trump or members of his administration, with that figure jumping to 21 percent for stories that contained Trump tweets, compared with 8 percent for those that did not. News stories that contained Trump tweets were more likely to focus on Trump’s leadership and character than those minus tweets, at 85 percent and 72 percent, respectively.